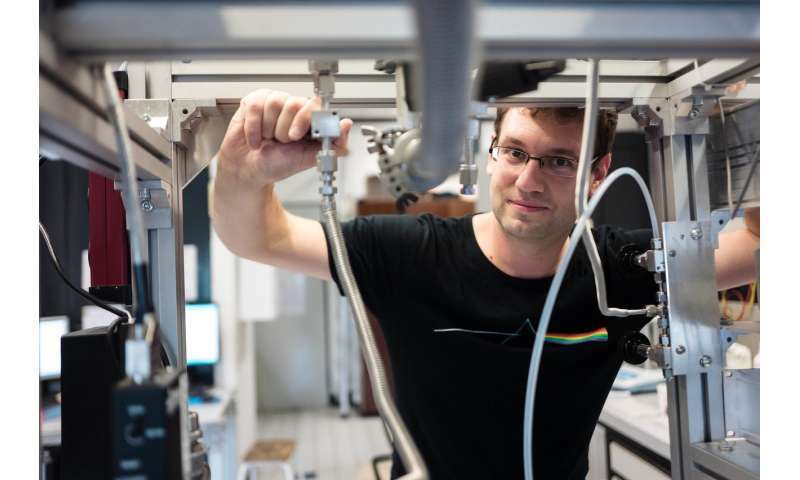 Chemists from Ruhr-Universität Bochum are hoping to find out how strongly the mirror-image chemical molecules – called chiral compounds – interact with their interaction partners. They are concentrating on halogen bonds that molecules with a bromine or iodine atom can form. These interactions are currently being investigated in many areas of chemistry as design elements for functional molecules, such as modern catalysts and new materials or pharmaceutically active compounds. The work of the researchers led by Dr. Christian Merten from the Department of Organic Chemistry II is being funded by the Boehringer Ingelheim Foundation as part of the "Plus 3" perspectives programme with around 760,000 euros for three years. The project starts in November 2018. Many molecules, such as amino acids and sugars, exist in two mirror-imaged spatial arrangements, but usually only one of them occurs in nature. "Biologically, the effect of chiral molecules can be very different," says Christian Merten, a member of the Cluster of Excellence Ruhr Explores Solvation, Resolv for short. "This is mainly due to the fact that the mirror-image forms interact with biomolecules such as enzymes in different ways." Chemists are therefore pursuing the goal of specifically producing one of the mirror-image forms and being able to precisely understand and predict its interactions with other molecules. The project "Stereochemical communication as probe for halogen bonding interactions" by the Bochum-based researchers is mainly dedicated to the second aspect, the strength of the interaction. A halogen bond forms between the positively polarised end of a carbon-bromine or carbon-iodine bond of a molecule and an interaction partner. The energy of this weak interaction is particularly difficult to quantify. "The interaction energies of model substances, which we can describe well with modern theoretical methods, are difficult to determine experimentally because the substances are often gaseous," explains Christian Merten. "But the model substances that we can easily handle experimentally are usually much too large and complex for today's most accurate computer models." In addition, halogen bonding interactions in solution often compete with other intermolecular interactions, such as the interactions with solvents. The team hopes to circumvent this problem with a new experimental setup. The researchers are replacing the solvent with noble gases that are liquefied under pressure and at low temperatures. They are inert and cannot form any disturbing interactions. For a number of model systems, chemists want to find out whether halogen bonds between chiral molecules have different energies. They are mainly interested in what happens when two different chiral substances interact with each other. The decisive factor here is which mirror images meet. "This is like two hands shaking each other," Christian Merten explains. "The handshake works optimally with two right or two left hands; with one right and one left hand, it does not." The two types of interaction differ in the energy they contain, depending on how well the molecules fit together. The scientists want to measure how big the difference is. "Our goal is to one day be able to predict which structural elements are needed to make this process of chiral recognition as efficient as possible," says Merten.